which is characteristic of the stirred-tank chemical reactor models (207-209). Combining these containment profiles, NT(t), with diffusional transmembrane transport, yields expected tissue profiles. The time-dependent concentrations are dictated by both containment profile and tissue affinities, and the magnitude is often dominated by transmembrane flux (see "Mechanisms and Models of Transmembrane Transport"). A pictorial representation of the processes is shown in Figure 9. 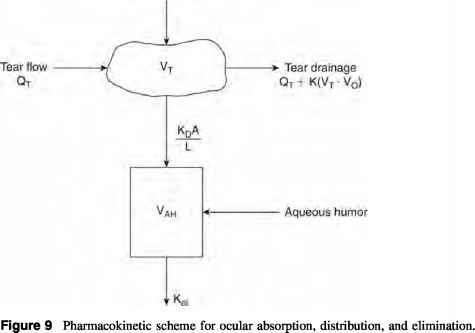 Pharmacokinetic modeling with this scheme has been successful in fitting the aqueous humor levels of pilocarpine following topical administration (Fig. 10) (203). 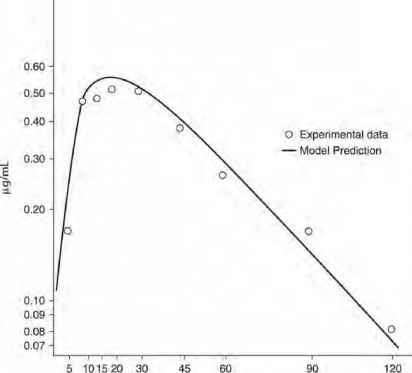 Although this type of data fitting has been quite successful, there have not been a sufficient number of systematic studies to determine the role of every molecular and physiological property influencing each of the various pharmacokinetic parameters. 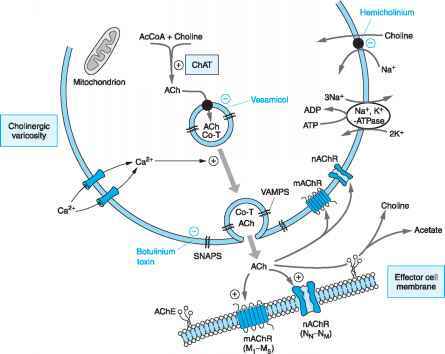 The pharmacokinetic consequences of these competing transport processes have been reviewed recently (210). Elaborate analyses of such data using Green's function solutions, for responses to unit impulse, can be integrated as a means of generating responses to more complicated dosage regimens (211,212). Alternatively, and more simply, the differential equations representing the coupled effects of instillation, hydrodynamics and drainage, and membrane transport can be readily integrated numerically to provide predictions of the impact of drug and dosage form on bioavailability (11). Figure 10 Comparison of predicted and experimental aqueous humor concentrations following topical administration of pilocarpine. structure: a multilayered, lipid-rich epithelium, a well-hydrated and lipid-poor stroma, and a lipid-rich endothelium of one-cell-layer thickness. Differential studies of the relative lipid densities for these three corneal layers have shown that the densities of lipid in epithelium and endothelium are approximately 40 times as large as that in the stroma (213), although more recent studies suggest that the disparity may be less (214). This can be a primary physiological factor influencing drug penetration through the cornea and into the aqueous humor. For a topically administered drug to traverse an intact cornea and to appear in the aqueous humor, it must possess dual or differential solubility. But as evermore explicit descriptions have been developed by histologists, microscopic anatomists, and electron microscopists, increasingly detailed mechanisms of transport through these tissues have been envisioned and tested. The multilayered corneal epithelium consists of cells attached by microstructural junctions of well-established morphology and function and separated by water-filled intercellular spaces. Drug transport through such an environment can be imagined to consist of two competing pathways. Predominantly water-soluble compounds presumably pass through the tortuously connected aqueous channels, establishing a path through the maze from epithelial surface to stroma, a paracellular pathway. Predominantly lipid-soluble compounds presumably pass by surface diffusion along the lipid surfaces, passing in a tortuous path from adjacent cell to cell, the transcellular pathway. In either case boundaries of lipid junctions for water-soluble compounds or aqueous channels for lipid-soluble compounds would be more readily surmounted by compounds with shared functionality. The characteristics of diffusion through and along such well-defined structures are well known, and the statistical mechanics of percolation phenomena governing such random paths has been well investigated. For example, several recent studies have attempted to provide a molecular basis for the earlier largely empirical observations and essentially macroscopic continuum analyses (215,216). For the stroma and sclera, much is known about their structure and composition. These tissues consist primarily of water, collagen, and glycosaminogly-cans wherein the lamellar order is derived primarily from collagen, which has a fivefold organizational hierarchy. The collagen molecule consists of three a-chains of peptides. These a-chains are organized into ordered, relatively stiff collagen fibrils, typically 50 nm in diameter. Many fibrils, along with proteoglycan-rich ground substance, compose collagen fibers, which are about a half-micron in diameter and in stroma and sclera are organized into nearly lamellar sheets (217-219). These membranes, over which there will be hydrodynamic pressure gradients, will be barriers to fluid flow. With the administration of drugs, these membranes, over which there will be concentration gradients, will be barriers to molecular diffusional flow. The effects of fibrous obstructions on both fluid flow and solute diffusion have been the topic of intense research in chemical engineering and physics. The flow and diffusional characteristics have been related to the relative dimensions and volume fractions of the fibers and the permeabilities (which is influenced by the state of hydration) of the different materials to the solvent and solutes, respectively. The diffusional characteristics of solute molecules will be influenced by the relative solubilities of these molecules in the different environments; more water-soluble solutes will diffuse more rapidly through the highly hydrated stroma. These effects, specialized for the geometries and materials properties of the collagen-rich stroma and sclera, have been calculated in a recent paper by Edwards and Prausnitz (215). They also modeled diffusion across the corneal endothelium assuming that the major path was between cells and that this was governed by the most restrictive portion, the diffusion through the tight junctions. The diffusional flow was predicted based on the density and width of these parallel channels. These authors generalized this description for both corneal endothelium and epithelium by allowing a balance between the paracellular and transcellular pathways. The only difference between the epithelial and endothelial paracellular pathways was the geometry of the junctions and their number, larger for the multilayered epithelium. The transcellular pathway was modeled from the known geometry of the cells, which determined the length of the diffusional pathway and the partitioning characteristics of the molecules. The cumulative effects of these barriers, and the resistance to flow they produce, were computed, and it was demonstrated that these macroscopically derived laws applied at molecular dimensions were able to provide semiquantitative agreement with the available data. While further tests of these models will undoubtedly provide refinements to our understanding, the agreement supports our understanding of the basic phenomena regulating transport of therapeutically active substances through these barriers, and the role of disease states that impact hydrodynamic pressure on the efficacy of drug delivery.